Nico Rosberg converted his pole position into race victory over teammate Lewis Hamilton to top off The German's perfect weekend at the Mexico GP. - Nico Rosberg held off Lewis Hamilton to take first place, while Valtteri Bottas secured a podium position for Williams. - Both Ferrari's retired from the race after Sebastian Vettel crashed out, and Kimi Raikkonen collided with Valtteri Bottas for the second time in three races. - Kyvat finishes 4th, Ricciardo 5th, Massa 6th, Williams and Force India both in points. Perez, Verstappen, Grosjean complete points places. Pole-sitter Nico Rosberg and teammate Lewis Hamilton both made terrific starts, and the world champion moved into a slipstream before seeing his attempt at an overtake on Turn 1 fail. It was key Rosberg held off any early threats to build momentum further into the race, but despite the odd sniff from Hamilton, The German held his own and was utterly faultless throughout not just the race, but the whole weekend too. It was a disastrous race for the Ferrari team, just as many thought Sebastian Vettel could challenge for the podium. He crashed out of the Grand Prix causing a safety car, but before that Kimi Raikkonen was hit by karma and a flying Williams that sent him out of the race and earned a morale victory for Valtteri Bottas who Raikkonen hit on the final lap at the Russian GP. Vettel's crash caused a safety car and wiped out Rosberg's 3.5s advantage over Hamilton, but even despite that, the Mercedes driver remained cool under pressure from his teammate and retained his lead up front. Meanwhile, Red Bull's Daniel Ricciardo and Daniil Kvyat both took the opportunity to switch to the soft compound tyres, but Kvyat was to be beaten by the flying Valtteri Bottas on the restart for third! Lewis Hamilton struggled to close the gap to his teammate Nico Rosberg, which emphasised his inferiority the whole weekend in Mexico. Rosberg couldn't be beaten, Bottas earned a huge podium for Williams, both Force India cars finished in the points and Max Verstappen continued to impress the F1 world scoring another set of points in 9th. 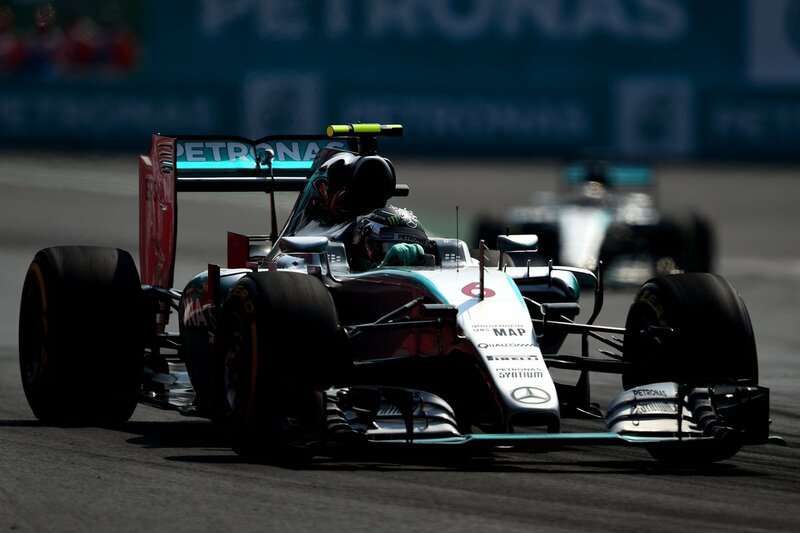 Rosberg after the race: "Amazing day, a great battle with Lewis, who drove really well. I'm really happy with the win, what a place to do it. An absolutely awesome crowd." Hamilton: "Nico drove a fantastic race. Just fantastic to be here in Mexico. This crowd is like a football crowd. The fans have been amazing. I've never seen anything like this." Nico Rosberg gains revenge, but it's still little too late as Lewis Hamilton already has the world championship bagged.